Whats happening in the month of December! Happy Friday! 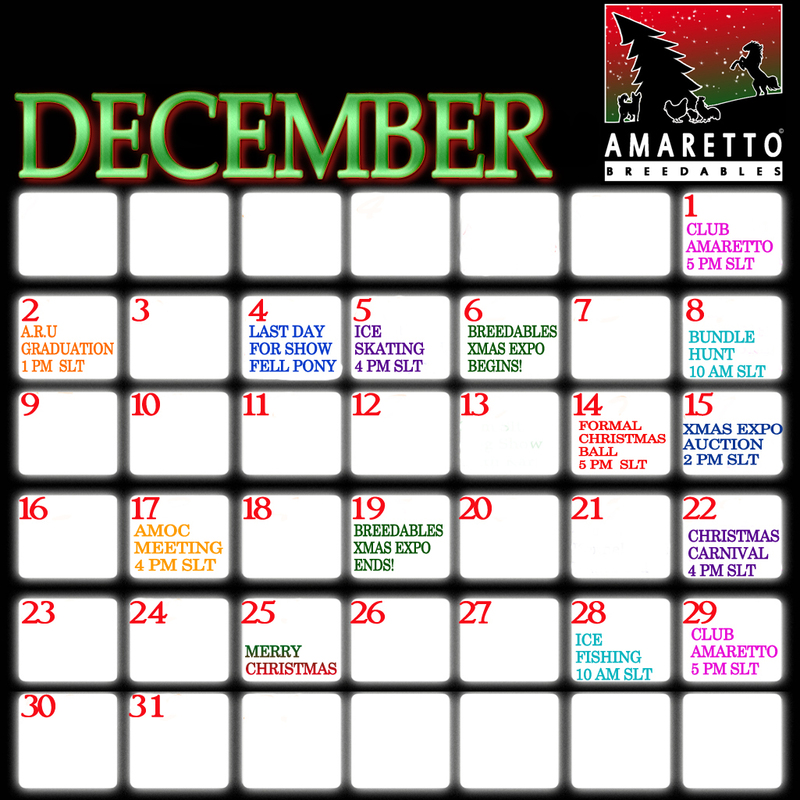 November has been a great month here at Amaretto, but December is just jam-packed with awesome events! We have Club Amaretto coming tomorrow, hope to see you out there “shaking your groove thang” but don’t party too hard cause you need to be up and ready for the Amaretto Ranch University Graduation! That’s going to be lots of fun! 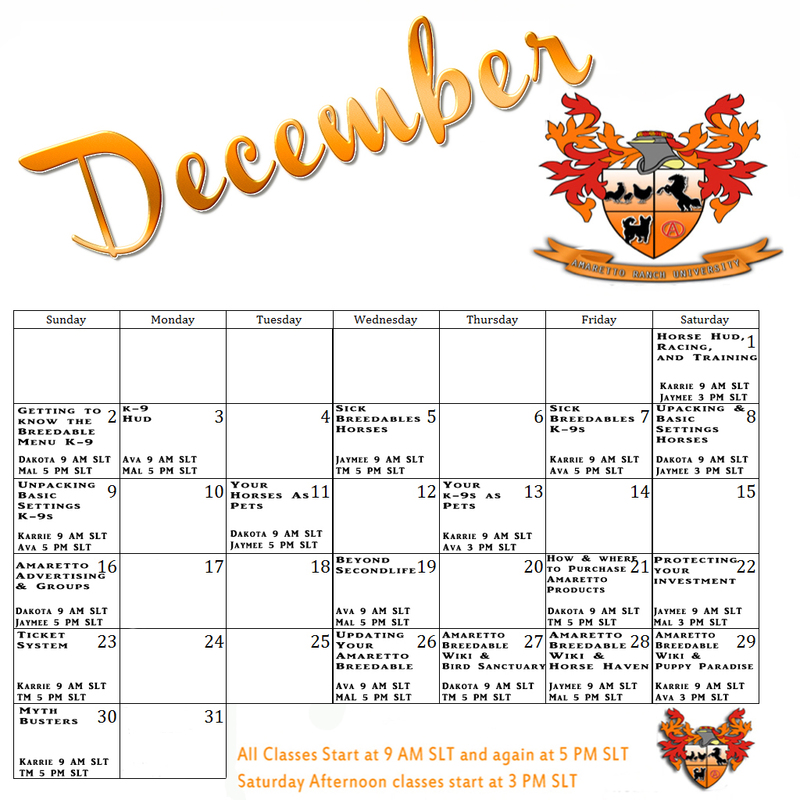 You can see the new calendars with the classes for next month at the University as well as the calendar with all the amazing events coming in the month of December at the links below! Mark your calendars and I hope to see you all out at the events! Until next time, Happy Breeding everyone! There have been some issues with a griefer lately which involves clicking a link and your account getting hacked. I just wanted to let you know how this new scam works and I also wanted to give out a few tips about protecting yourself from these kinds of griefers and thieves. 1. Hacker hacks your acct. 11. And it keeps going …. 1.) DO NOT CLICK ON ANYTHING, no links, don’t accept objects, etc. 2.) Always pay attention to who is giving you things. If you don’t know them don’t wear it… only rez it. If it asks you to give it debit permissions DECLINE IT!!!! Then delete it and purge it from your inventory. 3.) When dealing with Amaretto products they are no modify, no copy, no transfer. They can only be purchased from an Amaretto store and Marketplace or be given by one of the three Amaretto Business Avatars JJ Cerna, Ancient Biscuit, and Mazelina Menna. Any other avatar trying to give out Amaretto Products (other than animals of course) is a griefer or copybotter. Real Amaretto products will never ask for debt permissions!!!! Happy Hump Day Everyone!!! Hope you all are doing great! Well Amaretto has some great news today!! Everyone has been waiting to know what the next month’s Show horse for December is, well the wait is over! This December’s Show horse is Chimera Brindle Show Horse!! Now you gonna ask How do i get these? Well simple really just breed two chimera’s together any color has a chance of getting a Show Horse Chimera! So when is all this happening on December 5th 2012 at midnight? OK! So now you want to know what will pass right. The coat “Does Not Pass” but they can pass the eyes! The chance of getting a Chimera Brindle Show Horse ends on January 4th 2013 at 11:59pm sl time .So Good luck to you all for December! The Best in Show Jack Russell has a chance of passing the eye and the collar. Now don’t forget!!! All this is starting on December 5th at midnight and Ending on January 4th at 11:59 sl time . Happy Monday everyone! Hope everyone enjoyed their Thanksgiving weekend and got lots of goodies to gobble up! I hope that all of you got a Gobble Horse or a Happy Thanksgiving K-9 ! So I know TM showed you guys where the graduation would be held at but, I thought I would shed a little more light on when exactly the graduation will be! I double checked the stage to make sure everything was in order! I also tried on my cap and gown and I think I look pretty smart! What do you guys think? Also I will be sending out the invites to everyone, you can share with your friends, family, and fellow breeders! All the graduates have been contacted but there is still time for you to participate in the graduation ceremony if you have completed all classes! Just drop a nc in the mailbox in the courtyard, named graduation application if you have finished all your classes! So now the moment we have all been waiting for! I am proud to announce the very first graduating class of A.R.U. 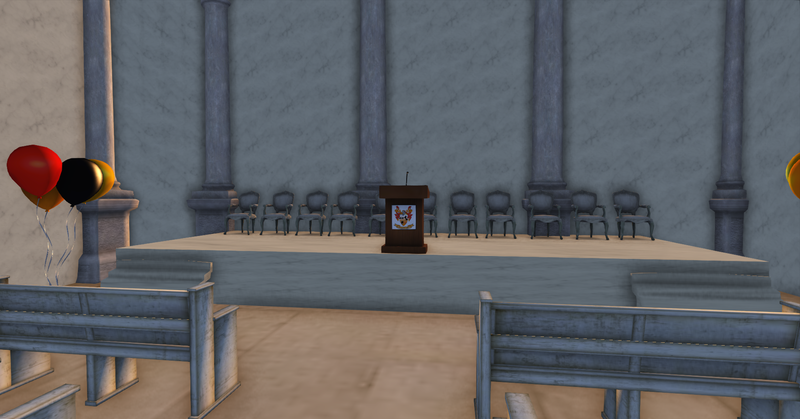 The following will be graduating on Sunday December 2, 2012 at 1 PM SLT! You guys are all invited to come watch and join in on the party afterwards!! Congratulations graduates you have earned it! I hope to see you all there, if you have any questions about the A.R.U. Graduation please contact Avalon Crystal! Happy breeding everyone this is Ava, over and out! Preview of the ARU Graduation ceremony! Hello everyone today I would like to share some pictures of the upcoming ARU Graduation ceremony! First off is a picture of the grand Ceremony Hall! 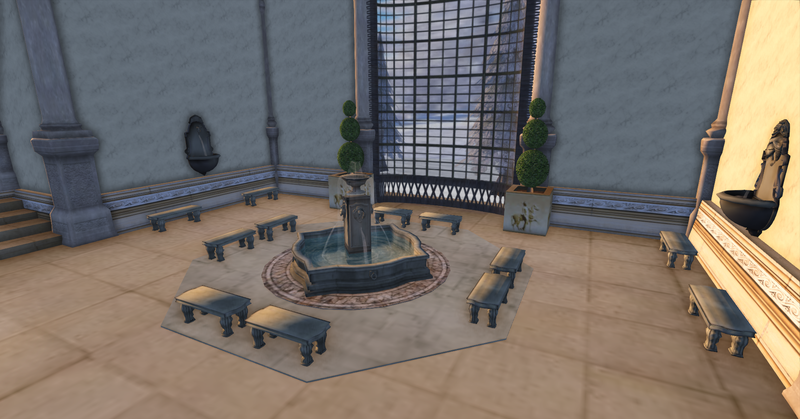 Next is the entry to the hall with the waiting area for all you impatient waiters! Now we move on to the main event the ceremony stage itself! And then once its all said and done its time to PARTY!!!! Once she receives your notecard, your class attendance will be verified through our website. (make sure you register!) If you have all your classes and your application is accepted you will be contacted in world. Now hurry and get those applications in and we will see you there! Lets start with the first important item…. AMOC stands for Amaretto Market Owners Coalition. Come out and share your ideas and views. TGIF! I am even more thankful that it is Friday this week because that means we all survived T-Day! I was thinking how much different things are during the holidays now that everyone is so “plugged in”. If I had a dollar for each time I had to tell someone to put their phone down at the dinner table, I could retire a rich woman! But this brings me to the many ways you can stay “plugged in” to all things Amaretto! We offer many different ways but today we should talk about the Amaretto Ranch Breedables Social Network, Twitter and Facebook. Not to mention it’s a great place to meet and interact with some of your fellow Amaretto community members. This area is found directly on the main page of our website in a panel of its own to the top right of the website. Here you will find the latest announcements and important goings on from Amaretto Ranch Breedables. Got a special event planned? This is the section for you! Post your events and check out events happening around the Second Life grid as it relates to Amaretto Ranch. You will find all the events that Amaretto does each month listed in this section. This area is for those who are interested in advertising their stores, markets, auctions and more throughout the pages of our website. The Amaretto Ranch Breedables website receives hundreds of viewers a day for a variety of reasons. Rest assured this is a great way to draw on a Second Life breedable audience. Our community LOVES to post photos of their prized breedables, the bloopers, special events and new breedables being born from the latest updates. If photos are your thing then this is the section for you. Create, upload and manage your very own breedable photo albums here. If you have a special interest or would like to create your own….Groups is the section for you! Here targeted groups of people create and participate in group style topics that range from Specialty Breedables to the rare and hard to find. This is the spot you can find out about all the classes offered at the Amaretto Ranch University or ARU. For those of you attending classes at the University this is the site where you can keep up with all the classes you have taken already and the ones that you need to take in order to qualify for graduation. Are you in the right Amaretto Group? This may well be the most important section you’ll ever look at! 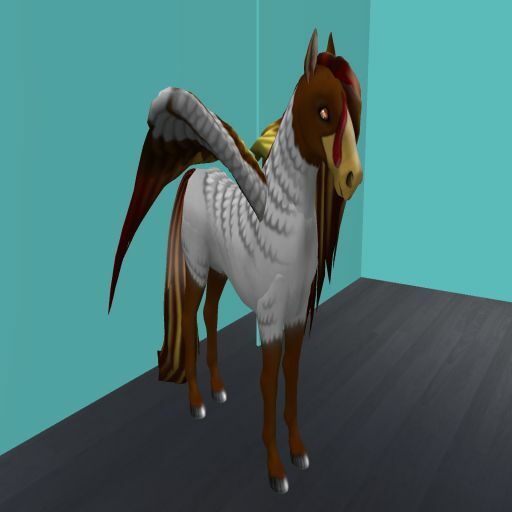 In the Help section you will find links to the Wiki Manuals for all the Amaretto Ranch Breedables along with How –to Videos. The answers to most all your questions can be found here! Sometimes we encounter issues with our breedables, or maybe you just want to submit a suggestion, well this is the section you will need. The Support section is where all communication with Amaretto CSR’s takes place and where you can submit tickets for issues and suggestions. That’s what you are reading right this minute! Amaretto Ranch Breedables CSRs do daily connections. This is the section to view current and past Connections. There is LOADS of useful information located here. Find out the entire goings on at Amaretto Ranch Breedables here. Did someone say shopping? 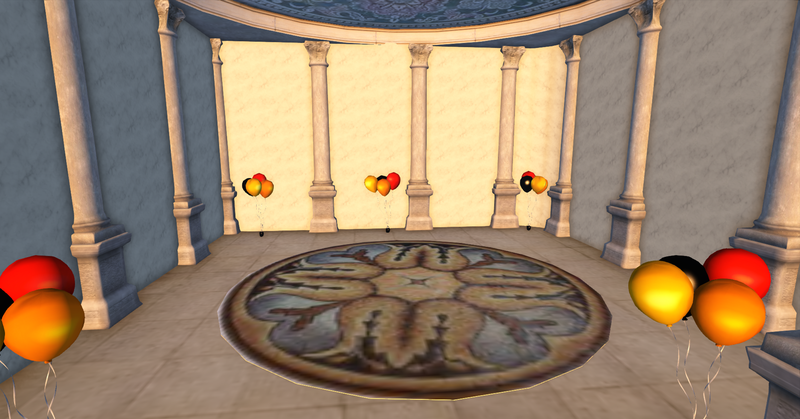 This section is where you will find Amaretto merchandise that you can have whenever you log into RL. With the holidays right around the corner you should definitely have a look here for some of your gifts! These are just some of the things that you will find and can do at that Amaretto Ranch Breedables Social Network. By now everyone has heard of or is already using Facebook and Twitter. Amaretto Ranch Breedables has its own place on both networks. Sometimes we give special little updates there that you just might not see in world. So be sure to add us to your Facebook and follow us on Twitter. Well horsefeathers I know I’m forgetting something. Oh I know I should also remind you that our wonderful group moderators in the Amaretto groups are also a wonderful source of information and humour. They exist on a steady diet of crazy flakes and cookies! So until next time stay plugged in and Happy Breeding everyone! A Message from Karrie ….. Happy Wednesday Everyone! Well Thanksgiving is almost here and I would like to wish you all a Happy Thanksgiving! Before you know it Christmas will be here, it is right around the corner. That just means it’s getting cold outside and winter is almost here! 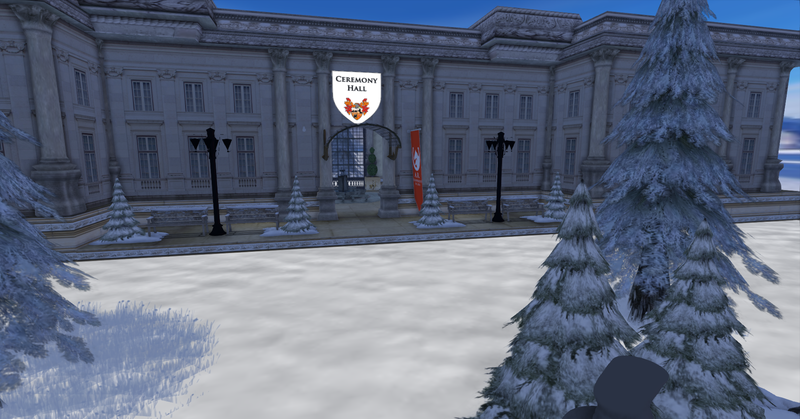 Amaretto is having an Ice Skating event on Saturday, November 24, 2012 at 10:00am Sl time. DJ Dakota will be streaming the tunes. So get them skates on an join Amaretto for a freezing good time! 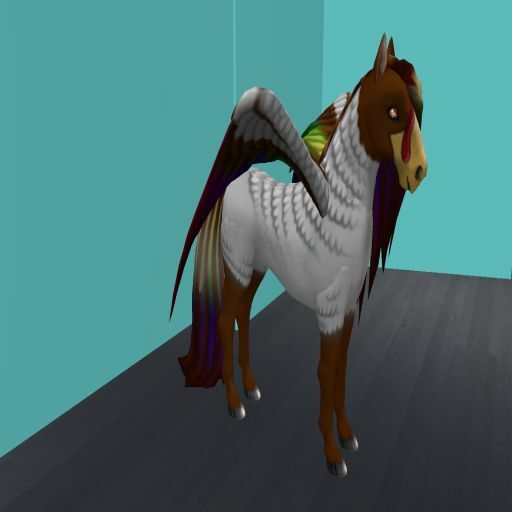 Remember starting today any bundles born from your horses between 12:01 AM SLT November 21st to 11:59 PM SLT on November 25th have a chance of giving you a Gobble Horse, the only requirement is that your horses be the most current version. Any kennels born from your K-9s that are most current version give you a chance at birthing a Happy Thanksgiving 2012 K-9 during this time. From the Happy Thanksgiving 2012 K9 the Collar: Fall Leaves has the ability to pass! So good luck and Happy Breeding everyone! Thanksgiving is usually for the birds……. Thanksgiving is usually for the birds, many of us in the United States are already prepping and preparing our menus for the Thursday. Here at Amaretto I have noticed a buzz with all those winged horses roaming around. Ive been keeping an eye out on them since they have arrived, they are a little standoffish since they became the 20th trait. Seems I can’t keep them away from the Memorable Haven Horses and Haven Horse Darkness, Im not sure what that is all about. I was more concerned with the Barnyard Birds protesting since we like to eat their distant relatives the turkey on Thanksgiving. The Barnyard Birds were unusually quiet I mean usually I hear them out there just clucking around most of the time. I thought I better go check on them and make sure they aren’t up to any funny business. Everything seemed normal there as I continued on my walk through at the Amaretto Ranch I heard a wild turkey noise. As I rounded the corner I saw a very strange rainbow turkey fly away from the horse pasture, as it flew away it had left something over in the bundles area. All the horses in the pasture were gathering around a bundle, I wasn’t sure what to make of this so I birthed it! You wont believe what happened next the cutest horse was born but something was definitely odd about this horse it looked like it had feathers and has the most interesting wings, nothing like a horse we are used to seeing. Then the horse took a step back and let out a big gobble sound! Then I knew what happened that wild turkey had done something to the bundles! I didn’t know how I was going to explain this to Josaphine I mean she leaves me in charge of the ranch and look what happens! I had to think fast, just as I was going over in my mind how I could explain this gobble horse to her, I heard the K-9s barking and yelping. Thats when I knew the wild turkey had visited the k-9s too. I just knew this had to be revenge for all the years of eating turkey on thanksgiving! When I reached the kennels I saw they had fallen victim to the same fate that the horses did. 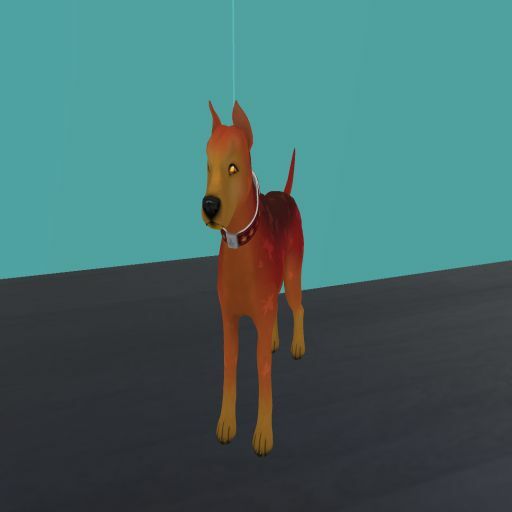 I birthed the kennel and to my surprise a very strange orange k9 was born. I knew I was in trouble now, so I got the gobble horse and the Thanksgiving K-9 and headed to my home and hid them within my heard. I sure hope that Mrs. Jospahine doesn’t find out or ill be in trouble for sure. Well I do hope all of you guys have a Happy Thanksgiving and keep an eye out for wild turkeys visiting your breeding stocks from 12:01 AM SLT November 21st to 11:59 PM SLT on November 25th. Whatever you do please don’t tell Mrs. Josaphine what happened! Happy breeding everyone Ava over and out!